If you spot a black bear playing in a ravine in Yellowstone or a blue-footed booby performing a mating dance on a secluded beach in the Galapagos Islands, thank your lucky stars and enjoy the moment—soak it in, not everyone gets to experience this! Wildlife sightseeing is a trend booming across the world. Most of us go on an adventure with a checklist of wildlife we want to see: black bear, bison, and moose in Yellowstone or whales and sea lions off the coast of Alaska. Or perhaps some exotic animals: lions and giraffes in Namibia or tigers in India. If you’re like us, seeing the wildlife that your destination has to offer is half the fun of an adventure vacation. But here’s a fact: With the influx of tourism in some of our world’s most popular destinations, spotting wildlife is getting more difficult and therefore even more coveted. What you need is someone with intimate knowledge of the wildlife in your destination: the experts who understand these fascinating creatures and how they interact with their environment. With 30 years in the biz, we’ve come up with a list of the must-see wildlife you need to see when you get there. With our homebase in Montana, Yellowstone is literally in our backyard, and we share its ecosystem daily with all kinds of wildlife! We pride ourselves on knowing the ins-and-outs of this fascinating national park, and in particular: where to spot its much sought-after wild animals. Hayden Valley used to be an ancient lake bed and today it’s a wide-open expanse dotted with sagebrush, the Yellowstone River lazily lolling its way through. It’s thee wildlife haven in our world’s first national park and where we like to set up our spotting scopes to scan the hills. 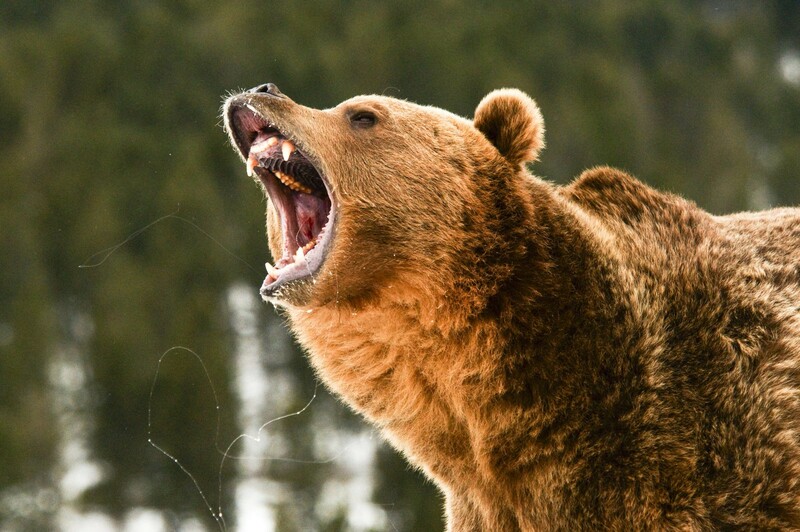 One of our favorite species is the almighty Grizzly Bear. This one’s a biggie—a wildlife buff’s must-see. There are approximately 800 grizzly bears in the Greater Yellowstone Ecosystem, but you won’t find them by lingering around the heavily-traveled boardwalks. After they rise from their dens in the spring, you might catch a glimpse of a grizzly bear lumbering around Hayden Valley on the prowl for carcasses, turning over logs hunting for insects or digging up roots and grasses to snack on. Sometimes, you’ll see these giants during daytime hours but the best time to observe them is at dawn or dusk. If you’re lucky, you might spot a griz from the safety of your car but we recommend bringing a spotting scope or binoculars to actively search out these solitary animals in the far-off hills. Besides spotting bears in Hayden Valley, you also might find bison, elk, coyotes and maybe even the elusive wolf. At sunrise, we got lucky and spotted a grizzly bear in Hayden Valley feasting on a snack (a big, tasty bison carcass). We spent over an hour quietly watching him: the powerful way his jaws crunched through bone, his observation of the nearby ravens not-so-patiently waiting for their turn at the carcass, and the way he batted around this massive bison like it was a ragdoll! It sounds so simple—a day in the life of a grizzly bear—but guides and guests alike stood there entranced and immersed in the spectacle. It’s this kind of WOW factor—when you’re 100% living in the moment—that we love being a part of! Pro tip: Be safe. If you’re hiking, carry bear spray with you at all times and hike in groups of at least 4 people. Make noise. Most bears will leave long before you get near them if they hear you coming. If you’re nervous about exploring bear country, go with a trained professional. Our guides know how to safely hike in Yellowstone (with its bears and all) while educating you on how to practice bear safety – all while enjoying some of the best landscapes this country as to offer. It’s the hidden jewel of Alaska, and one of the best places to experience the vast array of wildlife that Alaska has to offer. At Resurrection Bay, you can sit and watch the wildlife unfold from the shore, a boat or even the deck of your lodge. The truth is, you’re never prepared for the magnitude of your first whale sighting. There’s nothing like seeing the seagulls fly overhead as you watch the spray from a humpback whale’s blowhole as they prepare to surface. Perhaps the most magical behavior of all: the breach, when a whale propels nearly its entire body out of the water, landing with a loud, enormous splash! You’ll be amazed at the raw power of these gentle giants. But that’s not even the beginning of the wildlife encounters that Alaska has to offer: from sea lions to bald eagles to sea otters, Alaska has it all. While venturing out from Fox Island via kayak, we got up close and personal with humpback whales in Resurrection Bay. It’s incredible how powerful of an experience it was watching these majestic creatures break the surface of the water mere feet from our kayaks. We also witnessed orcas swim up on the beach and to rub their bellies on the smooth rocky shore before scooting back into the depths! Pro tip: For whale watching, it’s all about the gear. Bring your binoculars, camera, and appropriate clothing (depending on the weather). We’re always ready for any circumstance, so our guests can concentrate on having an experience of a lifetime! But coming prepared doesn’t end with bringing the right gear; it’s also about what behaviors to recognize and where to look—the how and why. Do you know how to spot a humpback whale? Can you name the stunts they perform or why they are doing them? Our knowledgeable Alaska guides can tell you! Being educated about wildlife makes all the difference between a pretty cool experience and a mind-blowing experience. San Cristobal Island is home to the largest sea lion colony in the Galapagos Islands. These sea lions truly live the life of our dreams: lying around on sunny beaches. It’s a rare chance that you’ll travel all the way to Galapagos and not spot a sea lion. They’re everywhere! With its various beaches and exotic array of wildlife, the Galapagos Islands are a must-see for animal lovers! Get your checklist ready. Besides sea lions, you’ll see blue-footed boobies, sea turtles, tortoises and marine iguanas. The wildlife of the Galapagos have never learned to fear humans so you can get very close to many of the animals, but that doesn’t mean you shouldn’t forget that they are wild. Snorkeling off one of the many beaches of San Cristobal, we stared in awe as a giant sea turtle lackadaisically swam beneath us when all of a sudden, a playful sea lion swam up to us out of nowhere. At first, we froze (as much as you can while floating in water anyway) as this rather large creature swam directly at us! She quickly swam toward us within inches of our goggles, blowing bubbles straight into our faces, and then would rip around in a circle and repeat the whole thing over again. This playful pup was having the time of her life and so were we. To be that close with such extraordinary sea life, and to be practically pulled into its silly games as we floated along, is an experience we won’t soon forget! Pro tip: Don’t miss out on the adventure! Consider investing in a GoPro or similar camera when swimming off the coast of the Galapagos Island. Most GoPro cameras can withstand depths up to 40 meters. Perfect for capturing awesome coral reefs, playful sea lions, or passing by turtles. When it comes to providing top notch wildlife encounters, we’ve got over 30 years of experience in countries all over the world. Know what you want to see but not sure where to start? Give us a call and we’ll help you discover the wildlife experience of a lifetime!